View More In Fermentation & More - Page 4. PLEASE NOTE that H&Q products is the SOLE SELLER of this item, and quality will not be guaranteed if you order from other sellers!!! Any organic vegetables and even fruits can be fermented, like sauerkraut, pickles, and kimchi. You can play around and try all sorts of funky combinations to discover some amazing tastes. Place your favorite ingredients in mason jar according to the fermented food recipes. Covering the jar with a Siliware easy fermentation airlock lid is the simplest way to start making your own fermented foods. Why Choose Siliware Fermenting Lid ? ★ Easy to use - Super simple design that makes the whole fermentation process much easier for both starters and enthusiasts. ★ Automatic venting - No need to burp jars daily to release excess pressure and maintain water levels. 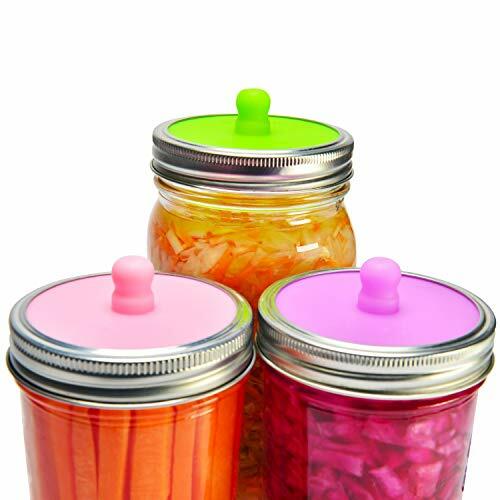 ★ Mold Free - Cover the jar with a fermenting airlock lid reducing the risk of mold without any daily maintenance. ★ Fits Any Wide Mouth Mason Jar - With a size of 3.35'' diam , each lid is perfectly suitable for all wide mouth mason jars. ★ Easy to Clean & Store - They are also convenient for both dishwasher cleaning and hand washing. ★ We have confidence in providing one-year quality services. If you are discontent with the product quality or usage experience, we will definitely provide a refund. ★ EASY-TO-USE for BEGINNERS OR ENTHUSIASTS - Vent gas automatically, no need to burp jars daily to release excess pressure and maintain water levels. ★ FITS ANY WIDE-MOUTH MASON JAR - With a size of 3.35" diam, each lid is perfectly suitable for all wide mouth mason jars. ★ EASY TO CLEAN - Flexible silicone lids gets cleaning done fast and efficiently on both dishwasher and hand-washing. ★ PREMIUM QUALITY - PLEASE NOTE that H&Q products is the sole seller of this item, and quality will not be guaranteed if you order from other sellers! Made of 100% FDA approved food-grade silicone, BPA-free and odorless, durable for many years. If you are discontent with the product quality or usage experience, we will definitely provide a refund. If you have any questions about this product by Siliware, contact us by completing and submitting the form below. If you are looking for a specif part number, please include it with your message.